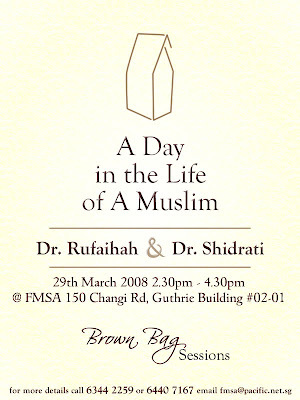 Fellowship of Muslim Students Association (FMSA): First Ever Brown Bag Session @ FMSA! Salam dearest brothers and sisters! wahahooo. haven't been updating this blog for quite some time eh? not to worry, we'll do our best to make sure this blog is as fresh as everrrr! All the details are on the poster. Credits to Bro Saiful who created this poster! Amat simple tapi cantik! Otaknya amat bagus! lol.